This is another easy way of using up old or close to over ripe apples before they are tossed into the compost bin. My mother-in-law, Momma Dot introduced me to this, another Southern dish, and has been a staple on our weekend brunches since. It’s quite easy to make, just peel and cut the apples into fourths or eighths depending on the size or your preference. Place apples in a sauce pan. Proportions will also vary for the following ingredients depending on the amount of apples you have, their sweetness, and again, your preference: butter, sugar, dash of salt, cinnamon, orange juice. 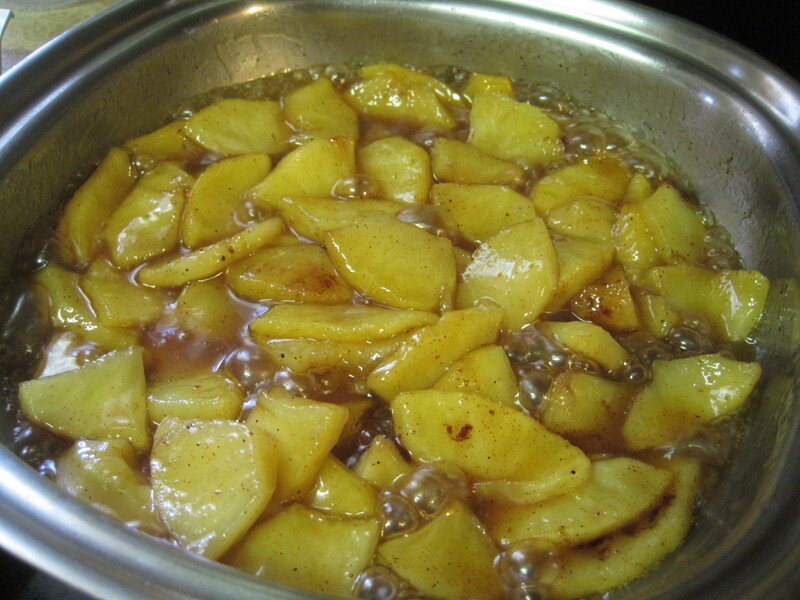 Simmer or ‘stew’ the mixture until the apples are cooked and the juices caramelized. This is great as a side dish to your usual breakfast fare or as syrup for pancakes and waffles. Myself, before my pre-diabetic state and when I could still indulge in ice cream, I liked having this with my midnight dessert, slathered over vanilla ice cream. I just posted a recipe for German Pancakes/Dutch Baby Pancakes that used stewed apples as topping so I decided to update this post with a new photo and a better formatted recipe. : The proportions for this recipe is easily adjustable depending on how much apples you’re cooking. I tend to not measure when I cook this so feel free to adjust the measurements below. Place all the ingredients in a pan and cook over medium heat until the apples are tender and the liquid has caramelized. About 20 minutes. NOTES: Use your favorite variety of apples. I use whatever apples need to be used up. You can also add other fruits like pears or peaches especially if they are getting a little too ripe and need to used up. hi purplegirl! Those are pancakes. I just made them smaller because that is how The Clone likes them. Actually, she likes them even smaller than that. 🙂 and syempre homemade no. are those blinis or pancakes? homemade or frozen? they look deliciously chewy. and a great paring for the apples.